*See details below for total costs including abutment and crown. Call For Dental Implants Now! The tried and true method for placing and restoring implants is still the best. We extract the unsalvageable tooth and fill the socket with calcium particles that serve as a matrix upon which new bone can grow. As the new bone forms around the calcium particles, the body dissolves the calcium particles away and excretes them out of the body. This results in a good foundation into which we can place the implant. It takes about four months for the bone to become dense enough to receive the implant. 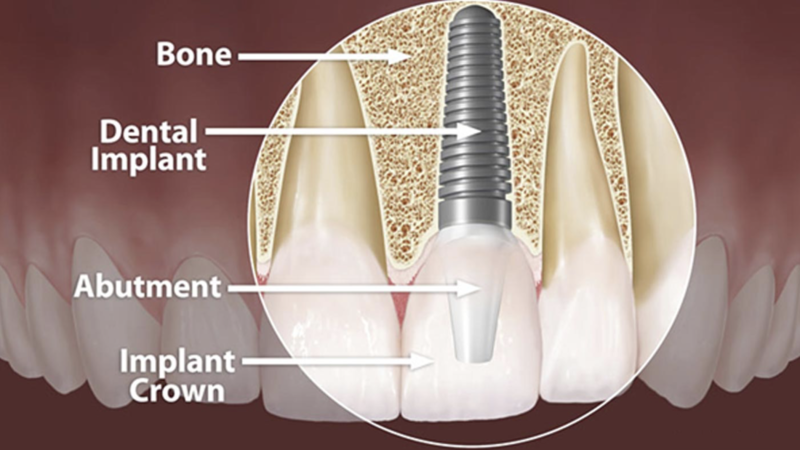 Once the implant is placed it takes about another four months for the bone to grow tight around the implant so that we can place a crown on the implant and you are ready to go with a great long term solution. ​There are cases where the root of the tooth is shaped so similar to the implant that we can place the implant the same day we extract the tooth. This saves about four months of treatment time. An implant is the ideal way to replace a missing tooth, and it has to be done with the proper technique and proper materials since you will be living with it for years to come. We do not compromise on quality, and we still offer reasonable pricing so that patients are able to afford the best solution for their situation. 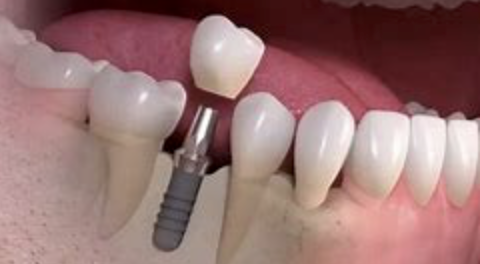 To fully replace a tooth, you will need at least an implant, an abutment, and a crown. The cost for the implant itself is $1,500 for each tooth, and later on the cost for the abutment and the crown is $1,500 for each tooth. So from start to finish, your total cost will be $3,000 per tooth. If the tooth is not missing yet when you present to our office, it will have to be extracted first. At the same time as we remove the tooth, a bone augmentation will also be performed. This fills the void of the missing tooth with calcium particles, upon which your own bone can regrow and become a suitable site for the implant placement. The total cost of the extraction and bone augmentation is $1,000, which is in addition to the costs mentioned above. For patients with PPO insurance, we are in-network with most companies, and sometimes your insurance plan will cover implants (but not always). Once you contact us we will get a breakdown of your dental benefits and we will be able to let you know ahead of time if and how much of the procedure will be covered by insurance. Also, there are cases where patients present with no teeth at all, and we are able to place as few as four implants and load them with a horseshoe shaped bridge that replaces all of the teeth in an arch. This type of implant retained bridge can often be placed and loaded with the bridge the same day as the extractions and placement of the implants!! This procedure is called “All-On-Four”, and requires a CT scan and lots of skill and planning. ​We have a wonderful team that we work hand in hand with and are having fantastic results… just imagine a person who has suffered the loss of virtually all of their teeth who can receive fixed teeth that look and function very much like natural teeth! And in many cases this can happen the same day the remaining unsalvageable teeth are extracted!